Introduction. Paphiopedilums, sometimes referred to as slipper orchids, are often regarded as the true aristocrats of the orchid world. They grow in Asia at a range of altitudes and are often found in Nature growing on the forest floor in leaf litter or on mossy limestone rocks, generally where the plants are continuously wet. They are usually exposed to bright light, rather than full sunlight or deep shade, which provides a good indication of how to grow these orchids, namely, to provide good light and plenty of water to plants grown in well-drained pots. Growing Media. I grow my plants in a bark-based mix containing 17% Canunda shell and 9% granite chips (by volume). I use 3-5 mm bark for pots up to 100 mm diameter and 5-10 mm bark for larger pots. The shell and granite fulfil two functions. They help to create similar conditions to those in Nature and to keep the mix ‘sweet’ by neutralising any acidity that develops. Using this mix, I find few plants with unhealthy root systems. Watering and Fertilising. I water my plants when they need it, usually daily in summer and weekly in winter. The plants are also fertilised during four out of every five waterings, using liquid fertilisers; I never use slow-release fertiliser in the mix. On the only occasion I used a slow-release fertiliser the plants suffered marked root loss. Growing Conditions. My plants are grown in an aluminium-framed glasshouse heated to a minimum temperature of 12°C, lined with Marix cloth and covered with 50% shade cloth. Smaller plants are grown on a wet bench and larger ones on wire mesh benches with water-filled corrugated fibreglass trays below to provide a high level of humidity, similar conditions to those that the plants experience in Nature. Before we acquired a glasshouse all our paphiopedilums were grown on our dining room table, where the light in this rather bright room was filtered by thin nylon curtains. The plants were placed on saucers containing small stones, which retained water when the plants were watered, thus helping to maintain a local humid atmosphere. When the water evaporated from the saucers, it was time to water again. It’s important not to place the plants near a heater, because this will lower the humidity too much. When growing slippers indoors I was still able to win the occasional show ribbon. 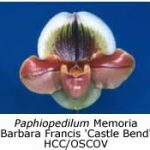 Types of Paphiopedilums. 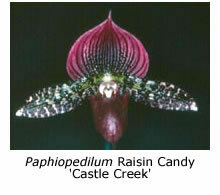 Paphiopedilums can be divided into a number of different groups. Taxonomists have had great fun dividing the genus into sub-genera, then into species and then dividing these species into new species. 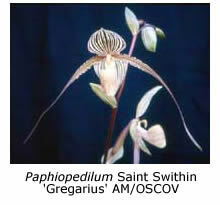 You can divide most paphiopedilums into several different groups. One group contains the multi-flowered slippers that bear a number of flowers at the same time – two beautiful examples are Paphiopedilum rothschildianum and P. philippinense. They generally need heat and like good light. Sequential flowering paphiopedilums have many flowers on an inflorescence but usually as each new flower opens, the older one dies. These slippers may flower for more than a year from the same inflorescence; P. primulinum is a good example. Other single-flowered paphiopedilum species may be divided into various sub-groups, such as the brachypetalums, the Maudiae-type species, the Chinese species etc. On the show bench we divide paphiopedilums into a number of groups. Species are usually given their own class but the hybrids are divided further into several classes. One class is for exhibition-type paphiopedilums, which are my favourites. These are highly developed hybrids carrying large, round, well filled-in flowers. They are the end result of breeding programs that have stood the test of time. In large shows the exhibition type hybrids are often divided further into colour classes. The other classical group of hybrids are the Maudiae-type paphiopedilums, which are similar in shape to P. Maudiae, a cross between P. callosum and P. lawrenceanum. Each flower has a large, round, striped dorsal sepal and down-swept petals. 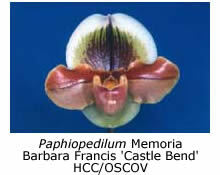 Many orchids do not quite fit this class – sometimes these are judged as Maudiae-type hybrids and at other times as novelty hybrids. The main rule in judging any orchid is for the judge to assess the orchid in the class where it will do best. The third group includes primary hybrids (crosses between different species) other than P. Maudiae. Some excellent primary hybrids include P. St. Swithin, P. Gold Dollar and P. lantha Stage. However, not all primary hybrids result in worth-while improvements on the parent species. Novelty Hybrids are those crosses made using a species as one parent (and a hybrid as the other) while Developmental Hybrids are those that don’t fit any of the above classes. It’s common for novelty and developmental hybrids to be lumped together. Paphiopedilum Propagation. 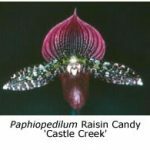 Paphiopedilums can be grown from seed in the same way as most orchids and most experienced paphiopedilum growers will have raised a number of seedlings from flask. Flasks are readily available, the price depending on how hard it is to get seed and the rarity of the parents. Chinese slipper seedlings tend to be expensive because these paphiopedilums seldom produce much seed. The other way to obtain plants is to purchase divisions from other growers. Unfortunately paphiopedilums are not amenable to mericloning, so the only way to obtain a top-class paphiopedilum is to buy a division. Consequently, divisions of awarded plants are highly sought after and are therefore expensive; fortunately, most retain their value well. Preparing Plants for Show. Paphiopedilums need little work to prepare them for showing. As for most other genera, this statement is especially true of the better clones. Most inflorescences will need to be staked. Folded tissue paper can be used to force protruding petals back, as can also twistie-ties, cotton buds or foam wedges. We prefer to arrange our plants in baskets, partly because this is an easy way to transport them. Baskets topped with coconut fibre serve to hide ugly plastic pots, while allowing a collection of plants to be shown to their best advantage.